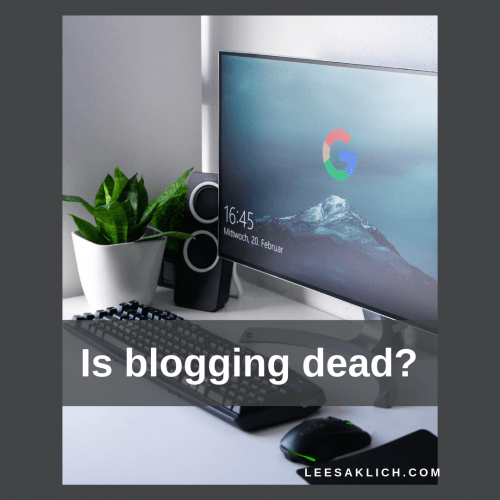 Is blogging dead? How else are you going to be a findable expert? And how about using your blog as a resource library? Signing off and toasting: Blogging isn’t dead, it’s a solid strategy for a sustainable business. Every biz coach has an opinion about how much value blogging has for online entrepreneurs. There absolutely is 100% value in collecting and displaying your best content and intellectual property (i.e. blog posts) on a platform that you own (i.e. your website). Please don’t try to build your business with social media, a landing page, and a “buy now” button! Ideal clients can find you because your best content is in one place on the internet (preferably a place you own and can’t be “shadowbanned” from). Those ideal clients that find you–because they’re searching the internet for a solution–are ready to buy (they’re “warm”)! Providing awesome content free–before asking for an email address to access it–allows you to demonstrate your expertise, build trust, and be generous without expectation of anything in return. On the other hand, if you ditch blogging and just focus all your time and energy on third-party platforms (social media & paid ads), you’re constantly spending time “warming up” a cold audience. You’re out there (with all the other people in your industry) getting in front of thousands of people hoping to encourage a few who may be slightly interested in your freebie. I’m not saying not to do this. But, in addition to social media and paid ads to “cold” audiences, don’t you also want to be found when people are looking for you because they’re ready to buy? The wellness industry is now over $4.2 trillion (way bigger than pharma, BTW! ), so standing out on third-party platforms (i.e. social media) is getting harder and harder. Ironically, I see very few people in the wellness industry blogging well and ranking in search engines; but, we both know that loads of people are searching the internet for your solutions to their problems and you’re not getting found! Can you see the opportunity of having all your amazing content in one place where people can find you? And, your blog itself acts as a free, valuable, give-before-asking library of your expertise and position AND a conversion tool to increase your email list of warm leads! The thing with online marketing is that the objective is to constantly grow your email list. Yep! With or without a blog your email list is key. There are people searching the web right now for solutions you have to their problems. They’re at the end of the buyer’s journey–they’re doing research and they’re literally getting ready to buy. Now. If they’re not already on your email list or in your social media sphere (organic or paid) let me ask you: Without a blog how will they find you? How are people going to find you to join your email list and inquire about your products and services when they need you? Answer: Being findable on search engines! If your only way of growing your email list is via social media or paid advertising, you’re missing out on HOT buyers in the last stages of the buying cycle! Yes, online advertising can get you visibility quickly. It can grow your email list with people who are potentially going to eventually buy from you one day. Maybe. They will need a lot of encouragement to warm up to you (and that buyer’s journey timeframe is getting longer and longer!). Yes, that’s the whole purpose of a funnel–to warm up cold subscribers. But, I wonder if the reason why we now need 18+ “touchpoints” with new subscribers is that we’re targeting way too many cold people and not focusing on simply being there for the ones who are hot? Even after the “warming up” funnel, you will need to spend time overcoming objections because you’re trying to convince and motivate them that your product/program/service is the solution to their problem when you offer it. But, here’s how blogging is different. By publishing quality content that’s findable by search engines you have more sustainable visibility in the long run. It doesn’t rely on regular advertising fees to a cold demographic that likely will never buy from you. I think of it like a slow-cooker: put in the effort up front, wait for the magic to happen on its own, reap the passive benefits. HINT: Now’s the time to get in the game with at least a few kickass quality blog posts and search engine optimization! Imagine you are your ideal client for a second. You’re scrolling through social media knowing that the 2nd or 3rd post you see is a sponsored one (that’s conversion-optimized to get your attention, pique your interest, and get you to click through to a landing page). You’re part of the 97% of people who are NOT looking for whatever is being offered. You haven’t even started your “buyer’s journey.” You’re not aware that you have the problem that the marketer is trying to solve (and you probably don’t have that problem, anyway). You are most likely never going to buy from the advertiser. But, it looks interesting so you click anyway. The next page (landing page) is full of copywritten sales-psychology buzz words to get your emotions riled up and convince you that you are interested and need the stuff being offered. And heck, it’s free, so why not just give my email address and grab that recipe book, instructional video, or whatever. It looks good and promises great results! At this point, you get your “freebie” and a barrage of carefully-crafted funnel emails designed to eventually warm you up to the advertiser so they can make you an offer to buy the next step in the process of getting those great results. Entrepreneurs pay social media sites for a chance to buy your attention. Promising all kinds of results and benefits (are your ideal clients getting more skeptical of these kinds of promises?). Asking for something (e.g. email address) before providing anything in return. Now, stop being your client and be you–the credible, generous, online health and wellness professional. How does this process make you feel from their perspective? Is this the only way you want to collect leads? What about all of those people who are frantically searching the internet for you, but cannot find you? Those who want your solutions right now, but have to continue to suffer without them? Doesn’t having a “findable” blog with all of your best content make 100% sense in the world of online business? Yes, content marketing is totally worth it! The entire raison d’être of business blogging is content marketing. You’re publishing valuable content to market your business. Your blog is not the only piece of the content marketing system, but it’s the foundation. 71% of bloggers who maintain blogs for a business report that they have increased their visibility within their industries through their blogs. 69% of businesses attribute their lead generation success to blogging. That’s not too shabby seeing as a 100% increase is double (so 126% is more than double!). After three years, content marketing has an ROI three times higher than other marketing strategies (ref). How can you argue with a 300% difference? This isn’t a 10% increase, folks. These are significant numbers! According to Demand Metric, content marketing generates over three times as many leads as outbound marketing and costs 62% less (ref). And 70% of people would rather learn about a company through articles, rather than ads (ref). People would rather have a personal connection with a product, brand, or person. So, how do we connect with our audience and build the “know, like, and trust” factor with them? Because 70% of people feel closer to a company as a result of content marketing (ref). Sixty percent of people are inspired to seek out a product after reading content about it (ref). You will be able to refer your clients to your blog as their expert resource. Blog about common questions and problems and then share that link with anyone and everyone who can benefit from it. 56% of bloggers who maintain blogs for a business say that their blog has helped their company establish a position as a thought leader in the industry. I hope this answers the question: Is blogging dead? It’s not dead and content marketing is totally worth it. Blogging allows you to be found when people are looking for solutions to their problems and ready to buy. Plus, it’s a generous way to share valuable information with people for free and build your “know, like, and trust” factor with anyone online. Content is a long-term game, so be patient with measuring your outcome. There are no guarantees, but as with most things in life and business, persistence will eventually pay off (quitting won’t). Every single post does not have to be “epic” or “evergreen.” You can mix up the types and formats. Keep quality at the forefront, but you don’t have to “knock it out of the park” every. single. time. 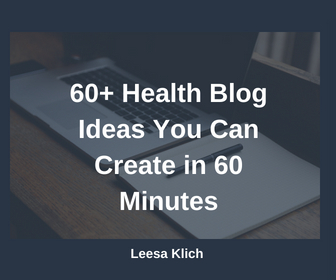 Want some health and wellness blog post ideas? How about how to (strategically) choose your next post? Don’t start from scratch every single time. Re-purpose your content like a pro with this guide. Blogging can help you to clarify the direction you want to move your business. When certain content feels awesome to you and is well-received by your audience, that may be a sign you’re on the right path. Want to know where to get blog posts? Even if you believe blogging is dead, please keep your best content and intellectual property on a website that you own. Use the marketing style that works and feels best for you–and feel free to mix it up, keeping quality at the forefront. Are you hopping on the bandwagon, or not? What do you think? Do you think blogging is dead? Do you believe that blogging is generous and allows warm buyers to find you when they’re ready to buy? What did you think of the stats? If you’re convinced, but stuck, I can help you!